The inside of the Scopes monkey trial museum in the basement of the Rhea County Courthouse in Dayton, Tenn. (Photo by Daniel Jackson/CNS). DAYTON, Tenn. (CN) – The grand opening of a renovated museum dedicated to the Scopes “monkey trial” – the famous 1925 case that turned into a showdown over creationism and evolution – did not go off without protest Monday. For Griffin, the 93-year-old Scopes trial was the start of the culture wars. Darrow was one of the first lawyers who worked to change society through the legal system. The trial, she said in an interview, was the harbinger for the issue over prayer in schools and questions over the display of the Ten Commandments. In a way, Monday’s ceremony to reopen the Scopes trial museum in Dayton, Tennessee, was a reenactment of what happened on that courthouse lawn one wet, hot July 93 years ago. 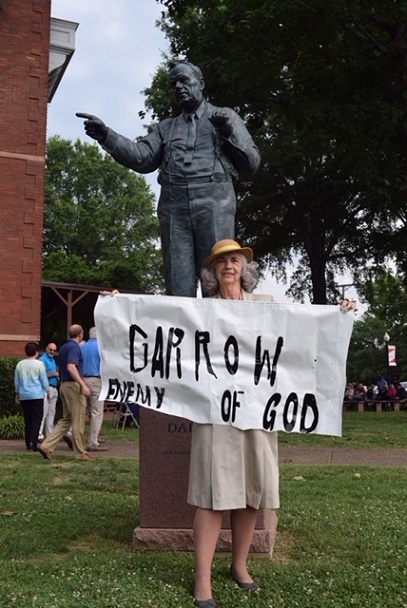 June Griffin holding a sign outside the Rhea County Courthouse criticizing attorney Clarence Darrow, who represented public school teacher John Scopes in a 1925 trial over the teaching of evolution in public schools. (Photo by Daniel Jackson/CNS). The trial was based on charges that a teacher violated Tennessee law by teaching evolution in a state-funded school. The case attracted national attention to the issue of modern science being taught to students. The teacher was found guilty, but the conviction was later overturned on a technicality. 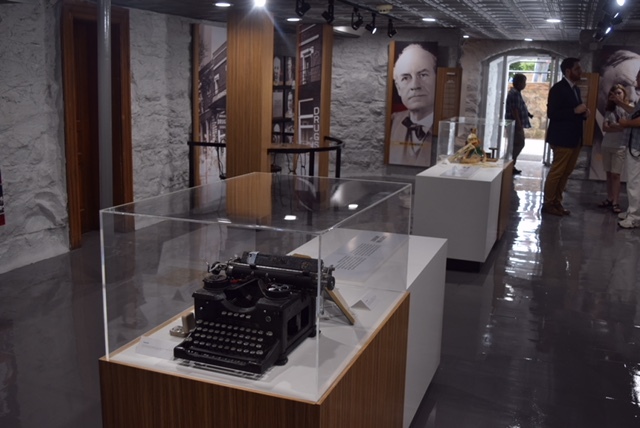 The museum that sits in the basement of the Rhea County Courthouse was due for a renovation. The last time it was touched was in the 1970s, according to Laura Travis, chair of the task force that raised funds for the museum and wife of Republican State Representative Ron Travis. That was when the courthouse made it onto the National Register for Historic places. Since that time, the building has fallen into disrepair. The roof leaks and the mortar between the building’s bricks is deteriorating. The task force acquired funds for those projects as well. The 1925 trial was a clash of two ideas in society that began when the American Civil Liberties Union sought to challenge Tennessee’s law forbidding the teaching of evolution. According to Tennessee State Historian Carroll Van West, it’s a debate still being played out. The Scopes trial – arguing one of the most covered misdemeanor trials of all time – was the first time that the debate aired in a public forum, he said. The legal fight quickly turned into a circus, an intellectual cage match between two megalodons of their day. Three-time Democratic candidate for president William Jennings Bryan joined in prosecuting public school teacher John Scopes, who was put up to the task of reading from a textbook on evolutionary biology. Put into contemporary terms, Bryan was a Bernie Sanders crossed with televangelist Jerry Falwell. As for Darrow, West said he might be compared in the modern era to someone like liberal lawyer and Harvard law professor Alan Dershowitz. Standing in the cool courthouse basement, its grey floor glistening with a fresh, epoxy coating, West said the message of the museum doesn’t differ much from that of the decades-old museum, but it does spend more time showing how the local Daytonites changed American history. In the middle of the room sit mementoes from those “monkey trial” days, such as monkey dolls and monkey-trial sheet music. And, according to Travis, some newly discovered artifacts. Tennessee Governor Bill Haslam at a ribbon-cutting ceremony for the reopening of the Scopes monkey trial museum in Dayton, Tenn. (Photo by Daniel Jackson/CNS). Dan MacNeill, treasurer for the county historical society, estimated that the museum cost close to $300,000 to produce, which included a grant from Main Street Dayton and private donations, including from the local liberal arts school Bryan College. Before the renovation, about 2,000 visitors would trickle into the museum a year. 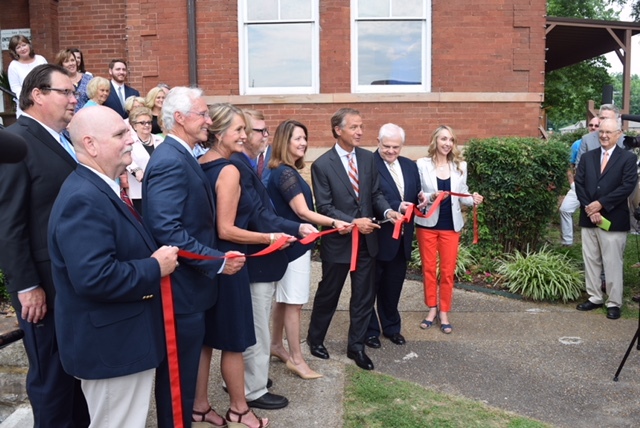 By the time Governor Haslam took a pair of black-handled scissors Monday and cut the red ribbon to open the museum, the Rhea County Historical and Genealogical Society had made steps to ramp up their tourism outreach. The group printed up brochures to put in rest stops across the state and Travis said it is planning on inviting local schools to come visit the museum. The Dayton community hopes to capitalize on the fact that historical tourism is the third most popular kind of tourism in Tennessee, coming in behind state parks and country music. But Dayton has undergone many changes since journalist H. L. Mencken put critic’s pen to paper to describe what he called “Monkey Town” while covering the trial. In recent years, a brewpub – Monkey Town Brewing Company – bubbled up a few blocks away from the courthouse. As Governor Haslam stressed in his remarks Monday, a tire factory will be coming to the area. Within the last few years, Rhea County Commissioner Emmaly Fischer said the community has hyped the good fishing in the nearby Watts Bar Lake and the high school, she says, has one of the biggest competitive fishing programs in the country. In a way, Dayton has undergone an evolution of its own. Meanwhile, Haslam, who has about 200 days left in office, said in the eight years he has been governor, he grew to understand just how important appointing judges is to a governor’s job. During his time as governor, Haslam appointed about 70 judges at the appellate and trial levels. And if he was at the Rhea County Courthouse when the Scopes trial was underway, who would he be rooting for?